Lucy is a qualified Nutritionist and whole foods cook. 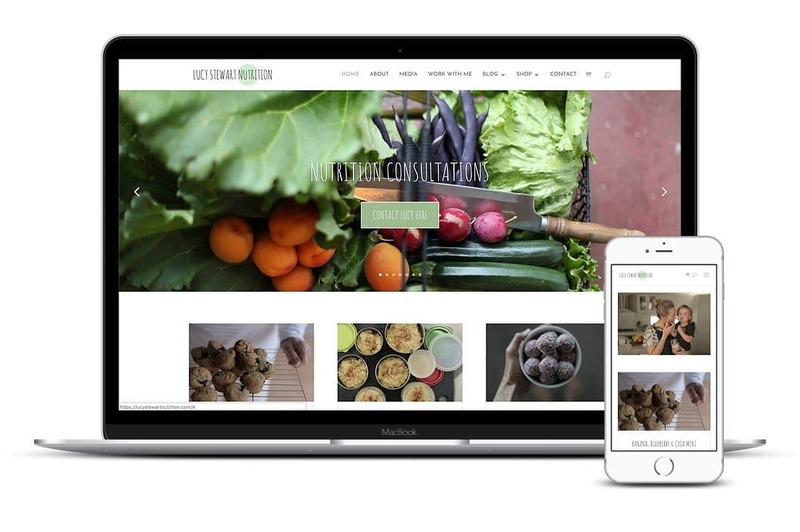 She needed a website to showcase her healthy recipes and provide services for her clients. She came to Let’s Build a Website and completed her beautiful website in only a few sessions. Lucy booked in our 2-hour WordPress training and we built the site together. We set up WordPress on Quadrahosting.com.au (one of our favourite hosts). Then yes again, we used the Divi theme (from elegantthemes.com). Lucy already had a design in mind for her website. A slider on the home page & an Instagram feed – to showcase photos. A blog – to showcase her recipes and bring traffic. A shop – to sell products related to her business. Social Media – To get followers and promote her business. MailChimp – To send our e-newsletters to her clients. A booking system – to book Lucy’s services via a platform called – Timely. Created several pages and layouts. So she just needed to paste the copy into the page layouts. And some content she would add later, as a work in progress. We added a navigation menu and logo. This amazing new online website that allows anyone to create professional artwork for their websites. For Instagram, we used Instagram Feed by Smash Balloon. Setting up the plugin involved connection it to Instagram. Then loading the widget into the footer. For Social Media, we used Monarch. This is a premium plugin. To set this up, all we did was choose which social media she wanted. And then added the URLs. After that, we loaded the Monarch Widget into the footer. This plugin also allows Social Sharing. You just need to turn this on, in the plugin settings. Social Sharing enables users to share your content. Woocommerce is the best plugin for a shop. Setting up the plugin includes adding business details, shipping and payment. Then creating products. Which Lucy learnt in the training. Lucy could then, confidently keep adding products in the future. We connected MailChimp to the plugin. And set up a signup box which we added to the footer. Now visitors could sign up to Lucy’s site and receive free recipes and information. Lucy and Let’s Build a Website finished the website together in about 3 lots of 2-hour training sessions. 6 hours in total. Lucy from Lucy Stewart Nutrition was very grateful for the knowledge she learnt. And the fact that she could edit the site whenever she wanted. Having full control.